Today’s educators and school administrators face a daunting task. They are expected to offer students a robust education that ticks all the traditional curriculum boxes, while at the same time instilling in children – more technologically savvy than ever – skills and attitudes that will help them thrive in a world in dizzying flux. teaching methods and teaching tools. 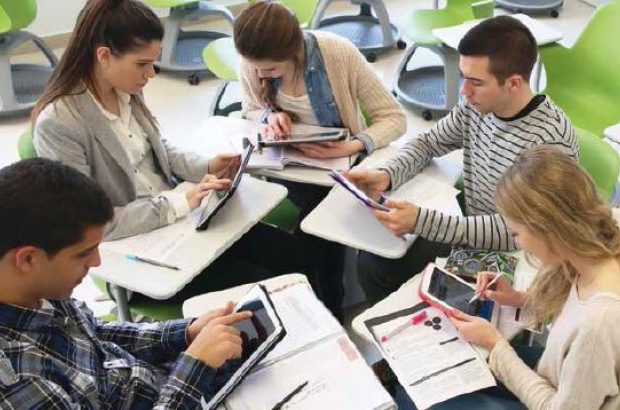 Many international schools and higher education institutions in Belgium have tackled these challenges head-on, embracing the opportunities offered by technology to help groom students for an uncertain future, and welcoming the disruptive forces that force them to rethink traditional approaches. Educational technology has long been a booming marketplace, and as once-expensive devices have become increasingly affordable, desktop computers, laptops, smartboards and iPads have begun to creep their way into classrooms. For school administrators, it can sometimes be tricky to separate useful new software and online tools from those that, in spite of breezy promotional talk, offer no real added value. At the British School of Brussels, administrators rely on the school’s 2020 vision statement – “Enhancing learning using leading-edge technology” – to distinguish between the good, bad and ugly. All the classrooms at the Tervuren school are fitted out with interactive whiteboards with mirror-casting software, which allows students and teachers to project their work so it can be shared and discussed with the entire class. The school also uses a learning platform called eBSB that allows teachers to communicate with students and share technological resources with them. Depending on the grade they are in, students are issued their own iPad or Windows laptop, or invited to bring in their own device, as this tends to better meet their needs for the chosen courses in the final years of secondary school. “In preparing students for future working life, it’s essential that their IT skills are the best they can be,” Hindley says. Educational innovation is of course not limited to the successful integration of technological tools in the classroom. For some schools, keeping pace with global and societal developments inevitably means making curriculum and teaching method adjustments – from the small to the big. The Brussels School of International Studies (University of Kent), for instance, is introducing a new foreign policy specialisation with the aim of keeping abreast of recent geopolitical developments. “This specialisation tries to reflect changing centres of gravity from Western Europe, with more emphasis on Asia and other parts of the world, and global change in general,” says academic director Tom Casier. Casier himself also introduced a new teaching method when he started teaching the school’s EU politics and governance module. The inspiration, he explains, was the realisation that students often struggle to understand the complexity of the EU decision-making process from learning about it through a textbook. Casier tried to remedy this through the introduction of a game at the end of the course. This exercise requires students to play a representative of a EU member state, first extensively researching a country’s likely position on, say, climate change and then presenting and defending this in a three-hour simulation exercise. Other schools have focused on instilling in students an attitude that will help them survive and thrive no matter what lies ahead. One of the key elements of the Bogaerts International School’s focus is to encourage students to think creatively, spokesperson Nicholas Lyddon explains. Technology in education is altering the vision of intellectual in education. I trust that technology can improve the learning experience in an integrative means. I consider that accepting the principles behind technology and how we apply those in the classroom setting can help students learn. Use of video help with dissertation to learn is also trending at the present time.